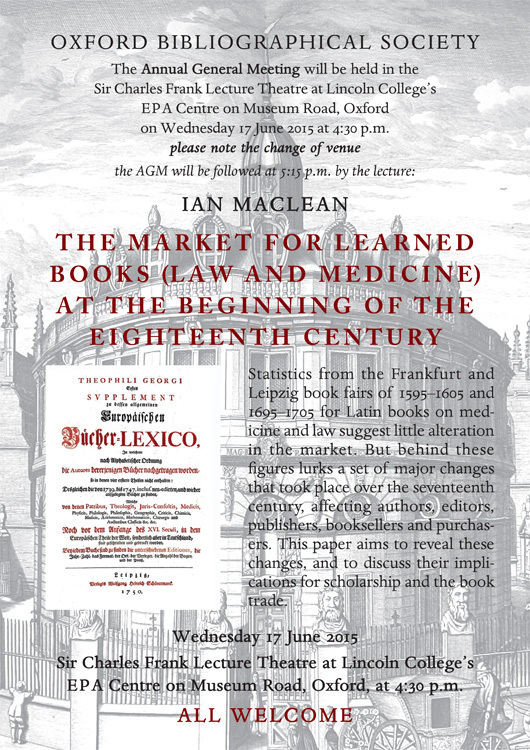 If one looks at the statistics from the Frankfurt and Leipzig book fairs of 1595–1605 and 1695–1705 for Latin books on medicine and law, one sees what is on the face of it, a very stable picture, with very similar declarations of new books in these areas. The statistics reveal that the continental legal profession still operated in Latin in this period, and continued to do so until the nineteenth century. The statistics for medicine show the rise of vernacular medicine (for use by the lay-person or Hausarzt), but also reveal that Latin remains the international language of medical disciplines and medical practice. But behind these apparently homogeneous figures lurks a set of major changes that took place over the seventeenth century, which affected authors, editors (of the works of others, responsible for their republication), publishers, booksellers and purchasers. The aim of this paper is to reveal these major changes, and to discuss their implications for scholarship and the book trade.